Overall, the 2010 US census found that the country's population was growing at a steady one per cent p.a. 17 April 2011: All the initial swathe of data from the April 2010 Census in the USA has now been published (end March 2011). It confirms the trend (see Part 1) of a substantial increase in the Latino population and of the movement of this group of people across the country. The Hispanic/Latino population and the number of people categorising themselves as single-race Asian both increased by 43 per cent during the decade. Latino people now make up 16 per cent of the population and Asian people five per cent. Black people constitute 13 per cent of the population. The movement of the US population towards the south and west has been a prominent feature in the decennial census in the last three decades. This trend has continued to be strong in the noughties. The overall increase nationally was 9.7 per cent which is almost exactly the same as the 1980’s and slightly lower than the 1990’s. Economic cycle factors were no doubt the cause of this fairly minor variation in a generally steady rate of population increase of around 1 per cent a year. With nearly 309 million people on April 1st 2010 the US is likely to have between 337 and 340 million residents at the time of the 2020 census day. In the earlier article on the census results l was optimistic about signs in the data of more sustainable development patterns in the world’s largest per capita energy using nation. The picture is mixed on this with more people living in metropolitan areas but densities and living patterns in them vary greatly. In some regions the movement from older core cities to suburbs seems to still dominate but in others growth and development are more balanced. 22 of the 30 fastest growing metropolitan areas in the US are located in the fifteen most populous states. It seems that American people like to re-locate to areas where there are lots of people but not necessarily in close proximity. The fastest growing large city was Fort Worth, which added 38 per cent in ten years and was 741,000 in April 2010. The fastest growing of the metropolitan areas, which had over a million inhabitants in 2000 was that based on Las Vegas, which grew by 42 per cent. Detroit lost the most residents in the decade. With 235,000 fewer people than in 2000 the city has experienced a dramatic decline. Cleveland lost 84,000 people and amongst other well-known significant cities Cincinnati, Pittsburgh and St. Louis all continued to lost population at high rates. Chicago also experienced large population losses though a much smaller percentage and it remains a vibrant and successful international city. Whilst the USA population continues to diversify and shift southwards and westwards and whilst some southern and some rust-belt cities continue to lose people as well as jobs it should not, perhaps, be overstated that those hose residents who describe themselves as single race white still comprise close to 2 in 3 of the US population. The population growth in the North East and Mid West of the USA is on a par with that of much of Western Europe and of Japan. And some of the larger cities stemmed the losses of people during the noughties. Baltimore, Milwaukee, Philadelphia and Minneapolis all suggest an emerging new stability. And at metropolitan area level in the USA the declines are few and where they did occur much less dramatic than at town or city level. At city level the southern part of the country presents a vivid contrast with cities in the Atlantic-facing regions experiencing large numbers of in-comers and those in the gulf facing regions losing people. Whilst New Orleans population loss was largely caused by the power of nature the same reason did not apply to the other declining cities in that part of the country. However, at state level this region did record increased numbers suggesting most of those leaving the cities went only as far as the suburbs. North Carolina and Georgia both had 18.5 per cent population increases. And many of the incomers were Latino. The Latino populations of the Atlanta, Raleigh and Charlotte metropolitan areas all more than doubled. In Raleigh and Charlotte many of these families located in the core cities. Raleigh gained 46 per cent more residents outperforming its metropolitan area, which gained 42 per cent. Charlotte gained 35 per cent compared to a metropolitan area increase of 32 per cent. In 2000 the metropolitan areas based on Charlotte and Raleigh were home to one in six of the state population. In 2010 it was one in five. Atlanta is a curious anomaly. It is situated at the core of a metropolitan area which added 24 per cent to its population during the decade and which was largely responsible for the increase in the population in Georgia. But the city itself gained only 0.5 per cent. Throughout the decade it was being talked up. For 8 years it had a splendid mayor in Shirley Franklin and several important improvements were made. Yet the census found that this had not persuaded people to move in or stay and that the suburbs were still the draw especially for Latinos arriving in the region and for the emergent black middle-class. Excluding the New Orleans metropolitan area because of the unique circumstances the worst performing metropolitan areas lost between 5 and 7 per cent of population in the decade. And these were almost all modest-sized places which had grown up around extractive and heavy manufacturing and now have limited appeal for most people. Amongst the largest losses were in Youngstown, Steubenville, Johnstown and Pine Bluff. In contrast, the metropolitan areas with larger cities at their core, which have been in trouble and which lost large proportions of their residents experienced smaller losses. Both Cleveland’s metropolitan area and Detroit/Wayne County were down by just 3 per cent even though Cleveland city was down 17 per cent and Detroit city was down 25 per cent. Clearly, a lot of the families who have left have not gone far. The trend for Latino people to move away from their traditional locations, often in search of construction work or lower living costs, is one which seems set to accelerate in the next ten years and may be replicated by the growing Asian population. This increased internal mobility amongst Latino families was responsible for a population fall in Santa Ana in Orange County, which has been the most Hispanic city in California. Overall, however, Latino/Hispanic people continue to become more prominent in California. Half of all children in the state are now Latino which will make providing them with good education an essential prerequisite for continued economic growth in a region which has for long been one of the world’s powerhouses. California just managed to maintain its record of always growing faster than the national average but by the smallest margin, 0.3 per cent, ever. The main growth centres in California have shifted inland. In the south the inland empire area centred on San Bernardino and Riverside grew much more quickly than the coastal areas whilst in the middle the central valley attracted large numbers of new residents. Bakersfield was amongst the fastest growing cities in the country with another 100,000 residents in a decade, an increase of over 40 per cent. Fresno was up from 425,000 to close to half a million and state capital Sacramento continued its recent high growth trend and with 466,000 inhabitants last April is now the 35th largest city in the USA. At state level Michigan was the only one of the fifty to record reduced numbers of residents though that was well within margins of statistical error at 0.06 per cent per year. Rhode Island was flat recording a 0.4 per cent increase in the noughties though here interestingly the largest city Providence, which has had some difficulties, was up by 2.5 per cent. Only Nevada added more than one in four people during the noughties at state level. Driven by the Las Vegas metropolitan areas 42 per cent increase it was up 35 per cent to 2 million 700,000 people. It gains an extra seat in the House of Representatives. 12 of the 435 seats are being changed as a consequence of this census, the same number as ten years ago. New arrangements will not be introduced until after the 2012 election. Texas has an extra 4 seats and Florida an extra 2. Six other states have one extra seat including Arizona which has added representation every decade since the 1970’s. Its 24 per cent population increase in the decade was less than expected. The public officials and the development sector and realtors seem to have confused and misled each other. Consequently, in the valley of the sun, where most of the population resides, there are now surplus properties. Ironically, this may spur renewed migration to the region. The notional number of residents required to secure a seat in the House was 711,000 in 2010. It is likely to be 780,000 in 2020. Texas grew by almost 20 per cent and its 4 million extra people took its population above 25 million before April 2010. It is now a majority minority state if those who describe themselves as both white and hispanic are included in the minorities column. Most of the new arrivals are living in urban and suburban settlements in the metropolitan areas. With six of the 20 largest cities the Lone Star state is set to become one of the most urban/suburban regions in the advanced world even though it includes large swathes of scarcely populated terrain. Florida grew by 17.5 per cent and is now approaching 19 million inhabitants. It is likely to become more populous than New York by the middle of this decade. Whilst Florida lacks very large core cities, Jacksonville is its only representative in the forty largest, it has a very high proportion of the rapidly growing metropolitan areas. Nine of the fastest growing forty in the last ten years are there. Densities are another matter of course. Over a quarter of the US population now lives in California, Texas and New York. By the 2020 census it is likely that one in three will live in California, Texas, Florida and New York. Around 750,000 of that one in three will live in El Paso. The growth there, in Albuquerque, in the Phoenix valley, in Greater Tucson and in Southern Nevada continues to be high and the south west continues to evolve from a backwater of the world’s leading economy to an internationally significant region. 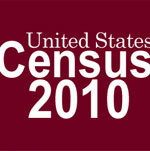 10 March 2011: Results from the April 2010 census in the USA are being published during March and April 2011. The administrators are under time pressure because the census is used to revise the allocation of seats in the US House of Representatives. After publication of half the data, the key trends are: Overall, the US population is growing by one per cent p.a. The Latino population is spreading across the country. The country is becoming more urban/suburban. The rust-belt cities are still shrinking. The data from both of the very large states, Texas and California, was published in early March. With Texas adding close to 20 per cent more people in ten years and California almost exactly on the national average 10 per cent it is the Lone Star state which will have more people and power in the next congress. Texas is likely to receive four extra seats whilst California will remain as it is. Given historical cultural and voting patterns this might be thought to be good for the conservative side in the US political divide. However, Texas is becoming very urban. Whilst the Republicans who control the state legislature will likely re-draw congressional boundaries to their taste it is becoming harder and harder to avoid basing constituencies on core cities. Overall, population growth in the US is remarkably steady. It has been 1 per cent a year for close to a quarter of a century now. On 1 April 2010 the population was 308 million. In comparison with some of the Asian countries it is a very manageable population growth rate. The census issues, which attract attention and generate controversy, are much more about who the population is and where they live. For the Federal Government’s Census Bureau all the difficult questions during their launch events will be about race and ethnicity. In California, which will be keen to maintain its diminished population lead over Texas at the 12 million identified by the census during this decade, some 50 per cent of children are now Latino. Educating Latino children well is now clearly the top strategic challenge to its economic future. The 10 per cent overall increase mirrors the 1990’s and has lifted the number of people living in the country from 280 million to 308 million. Variations in the growth rates for the 50 states are looking likely to be of a band from flat-lining to 35 per cent. At metropolitan and city level, of course, the band of difference is much wider than that. On the whole, the new data suggests so far that the increasing population is, as elsewhere in the world, leading to a more urban profile. The caveat in the US is, of course, that urban/suburban there does not necessarily mean at sustainable densities. That caveat made, and due notice taken that small middle-class enclave dominated settlements are continuing to multiply, there are some grounds for optimism about the changes in the first decade of the century. In several regions there is a discernable trend for the core cities to have been more attractive for residents and incomers than they were in the 1980’s and 1990‘s and some places associated with the wealthy and the retired like Huntingdon Beach in Orange County California have flat-lined. For US Democrats, the slower growth recorded in the famously Republican enclave of Orange County than in surrounding parts of Southern California will be a hopeful sign. North Carolina, with 19 per cent more people than ten years ago is one of the fastest growing parts of the country and the way in which people have distributed themselves there in the last ten years is very interesting. Perhaps because of an influx of Latino people who had not been present there in significant numbers hitherto and because there is some evidence that 150 years after the civil war black people may be moving back to the south the more urbanised counties and the two largest cities have grown spectacularly. In 2000 Raleigh and Charlotte combined housed one in ten of the population. In 2010 it is one in eight. Most of the metropolitan areas with Raleigh and Charlotte at their core are located in Wake and Mecklenberg Counties. These had a combined 1 in 6 of the population in 2000. In 2010 it is 1 in 5. As always in the US, signals are mixed. Nevada at 35 per cent is likely to be the largest population addition rate at state level. Here, whilst Clark County, which includes most of urban Southern Nevada, is up more than the average at 41 per cent, core city Las Vegas is much lower at 22 per cent. The economic crisis of the last three years has slowed the rate of newcomers arriving in the fastest growing locations but it has also damaged the troubled cities in the north and mid-west which have been affected by structural changes. Whilst Ohio, for instance, achieved a very small population increase overall Cleveland lost 88,000 people in 10 years. Pittsburgh, Cincinnatti and St Louis are other older cities, which continue to lose population at a high rate. The Arizona results were due as this piece went to press. They are likely to show very high increases in both urban and less urban areas despite the difficulties of recent years. The focal point of the USA continues to move south and west. The long-term impact of this in global terms will probably not become fully evident for another generation but it clearly is of considerable significance.